The Pacific Fishery Management Council’s (Council) Ad Hoc Ecosystem Workgroup (EWG) will hold a meeting via webinar, which is open to the public. The webinar will be held December 18, 2018, from 9:30 a.m. until 11:30 a.m. (Pacific Standard Time) or when business for the day has been completed. The purpose of this webinar is for the EWG to receive presentations on completed climate change scenario planning exercises and discuss application of these methods as part of the Pacific Council’s Climate and Communities Initiative. If you have additional questions regarding the EWG webinar, please contact Dr. Kit Dahl at 503-820-2422; toll free 1-866-806-7204, extension 422. The Council appreciates all of the nominees’ interest and willingness to serve. The Council reviewed the nominations and appointed Advisory Body representatives to the following positions for the 2019-2021 Advisory Body term. Additionally, the Council increased the number of California Sport positions on the Salmon Advisory Subpanel from one to two. The Council will solicit nominations for most of the remaining vacancies, including two at-large positions on the Scientific and Statistical Committee, after the November 2018 Council meeting for consideration at the March 2019 Council meeting in Vancouver, Washington. Visit the Council’s Advisory Body Vacancies web page for details. The Pacific Fishery Management Council’s (Council) Ad Hoc Ecosystem Workgroup (EWG) will hold a meeting via webinar, which is open to the public. The webinar will be held November 28, 2018, from 10:30 a.m. until 1:30 p.m. (Pacific Standard Time) or when business for the day has been completed. The purpose of this webinar is for the EWG to consult with members of the Council’s Salmon Technical Team on (1) how policies in the Pacific Coast Salmon Fishery Management Plan can address climate change impacts and (2) potential revisions to the Fishery Ecosystem Plan, especially in relation to the Climate and Communities Initiative. For agenda item topics and meeting information, please see the November 1-8, 2018 Council meeting webpage. If you do not have a headset or computer speakers, you may use your telephone for the audio portion of the meeting by dialing this TOLL number 1-562-247-8321 (not a toll-free number); enter the phone attendee audio access code: 240-052-611; then enter the Audio Pin: Shown after joining the webinar. The webinar is broadcast in “listen only” mode. The National Marine Fisheries Service (NMFS) publishes its proposed List of Fisheries (LOF) for 2019, as required by the Marine Mammal Protection Act (MMPA). The proposed LOF for 2019 reflects new information on interactions between commercial fisheries and marine mammals. NMFS must classify each commercial fishery on the LOF into one of three categories under the MMPA based upon the level of mortality and serious injury of marine mammals that occurs incidental to each fishery. The classification of a fishery on the LOF determines whether participants in that fishery are subject to certain provisions of the MMPA, such as registration, observer coverage, and take reduction plan requirements. Please see the Federal Register notice dated October 23, 2018 to view the proposed rule, and for instructions on how to comment. Comments on the proposed rule must be received by November 23, 2018. 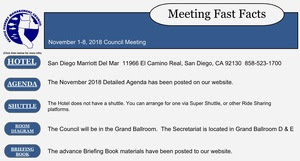 The November 1-8, 2018 Pacific Fishery Management Council meeting “Fast Facts” are available. Fast Facts are answers to FAQs that can help you get oriented for the upcoming meeting (transportation options, internet code, hotel map). The Briefing Book for the November 1-8, 2018 Council meeting has been posted to the Council’s website on the “November 2018 Briefing Book” webpage. The Briefing Book contains the meeting agenda, “situation summaries” (brief summaries that provide background for each agenda item), reports and materials for each agenda item, and written public comment. Advisory body and committee agendas and memos are also available.